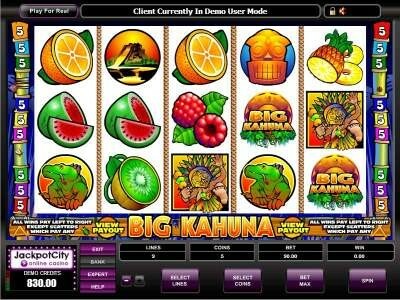 The Big Kahuna online game is a very exotic video slot machine that is powered by the leading name in the industry, Microgaming. This is why players can enjoy state of the art features, wonderful visuals and vivid audio effects. All of this makes for an amazingly entertaining gambling experience that Microgaming is well known for providing. Players can enjoy this experience at Gaming Club, Jackpot City or The Lucky Nugget among other casinos. The game has 5 reels and a total of nine paylines that players can bet on. This means that players will have 9 chances of winning. The game has a tropical theme to it. This is why players will see symbols on the reels that are inspired by the tropical life and the fruits. These symbols include a volcano, a tropical resident, pineapples, watermelons, oranges, coconuts, a golden mask and a green reptile among others. Players can find the wagering options under the reels of the game. The game also offers a set of special symbols and features. The volcano is the bonus symbol. Three of the volcano symbols can activate the bonus round. The logo of the game is the wild symbol while the golden mask is the scatter symbol.